We study the flow properties of red blood cells in confined channels, when the channel width is comparable to the cell size. We focus on the case of intermediate concentrations when hydrodynamic interactions between cells play a dominant role. This regime is different to the case of low concentration in which the cells behave as hydrodynamically isolated. 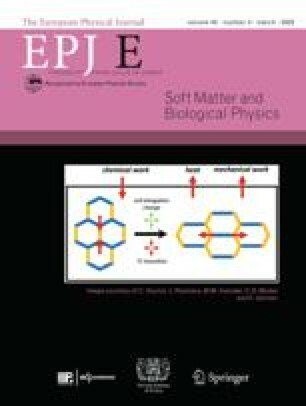 In this last case, the dynamic behavior is entirely controlled by the interplay between the interaction with the wall and the elastic response of the cell membrane. 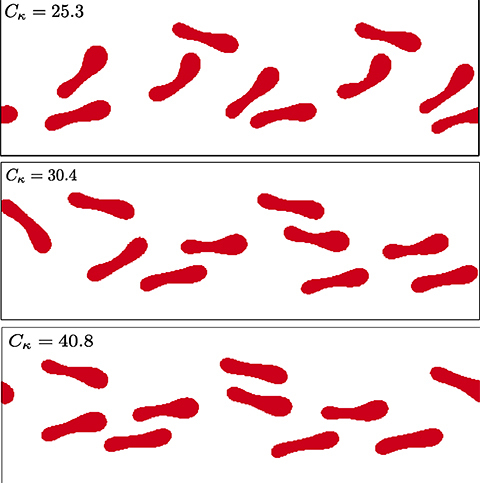 Our results highlight the different fluid properties when collective flow is present. The cells acquire a characteristic slipper shape, and parachute shapes are only observed at very large capillary numbers. We have characterized the spatial ordering and the layering by means of a pairwise correlation function. Focusing effects are observed at the core of the channel instead of at the lateral position typical of the single-train case. These results indicate that at these intermediate concentrations we observed at the microscale the first steps of the well-known macroscopic Fahraeus-Lindqvist effect. The rheological properties of the suspension are studied by means of the effective viscosity, with an expected shear-thinning behavior. Two main differences are obtained with respect to the single-train case. First, a large magnitude of the viscosity is obtained indicating a high resistance to flow. Secondly, the shear-thinning behavior is obtained at larger values of the capillary number respect to the single-train case. These results suggest that the phenomena of ordering in space and orientation occur at higher values of the capillary number.